Esther tells the king of the wicked Haman's plot to kill the Jews. STHER WAS HAPPY in her beautiful palace-home. She was kind to her servants, and they liked to obey her. But she did not forget how Mordecai had taken her into his own home when she was a poor little orphan. And every day she watched from her window to see him pass by, and always she was eager to receive the messages that he sent. She still obeyed him just as cheerfully as when she had been a little girl in his own humble home. But one day Mordecai did not pass by as usual. And Esther missed him. Perhaps she thought he might be sick. But soon her servants came to tell her that he was walking through the streets of the city, dressed in sackcloth and crying with a loud and bitter cry. "What has happened?" wondered the Queen, as she hurriedly gathered some new clothes to sent to him. How she longed to run out to comfort him, herself! But now she was the queen, and now she could not go about in the streets. Perhaps she wished that she were not the queen, after all. As she sat watching anxiously from her window, soon she saw the servant returning with the clothes she had sent. Mordecai would not take them, and Esther knew that some terrible sorrow had come into his life. So she quickly called another servant, one of the King's servants who sometimes waited on her, and told him to learn from Mordecai the cause of his intense grief. Mordecai told this servant about all that had happened to him, how Haman had planned to kill all the Jews and had even promised to give money to the King for this cruel purpose. He gave the servant a copy of the letter that Haman had written, and the servant brought the letter to Esther. He told Esther, too, that Mordecai had commanded her to speak to the King and tell him that she was a Jew, and that Haman had planned to kill her and all her people. At first Esther was afraid to go to the King. She knew the law of the palace: that any one, either a man or a woman, who should approach the throne without being called by the king would be put to death unless the king should hold out to that person the golden scepter. And she feared to take such a risk; for the King had not called for her in many days, and she supposed he was attending to important matters and did not wish to be disturbed. She sent her servant back to Mordecai to tell him that she dared not go into the presence of the King without being called by him. Mordecai believed that God had permitted Esther to become queen on purpose, so that she might at this time save the lives of her people. So he sent word again, telling Esther that she must go, for if she refused she would be sparing her life at that time only to lose it later, when all the Jews in Shushan should be destroyed. Esther still was fearful to obey the wishes of Mordecai; but she longed to help her people, and she promised to try. She commanded Mordecai to gather all the Jews in Shushan into one place, and there to fast and pray for three days that God would give her favor in the eyes of the King. She and her servants would also fast during that time, and then if Ahasuerus had not yet called for her she would go to him, contrary to the law of the palace, and plead for her life and for the lives of her people. Mordecai hastily called all the Jews in Shushan and told them of Esther's words. And they fasted and prayed as she had commanded. Then, on the third day she dressed in her most beautiful garments and went in to speak to the King. Ahasuerus was surprised to see the Queen standing timidly in the court before his throne. He knew some urgent matter had brought her there, and because he loved her he held out to her the golden scepter, which was in his hand. Then she came near to his throne and touched the scepter, and he asked, "What is your request, Queen Esther? It shall be given to you though it should be the half of my kingdom." Esther did not tell him at once about the great sorrow that clouded her life, but she requested him and his friend Haman to dine with her that day. And the King promised to come. Then she went away, and Ahasuerus sent word to Haman, telling him of the Queen's invitation to dinner. 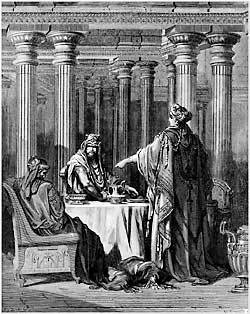 Haman felt highly honored because he was the only guest invited to eat with the King and the Queen. But Ahasuerus guessed that Esther had some great request to make of him, so again he asked, "What is your wish, my queen?" And again Esther answered simply, "If I have found favor in your eyes, O King, my request is that you and Haman shall return tomorrow and dine with me as you have done today. Then I shall tell you what is my greatest wish." And the King promised that they would come. After the banquet Haman hurried home to tell his wife and his friends about the great honor that Queen Esther had shown to him. But as he passed through the king's gate he saw Mordecai sitting there and refusing to bow before him as the other servants were bowing. This spoiled all of Haman's gladness of heart. How he despised that Jew! He longed to be rid of Mordecai's presence in the king's gate, and he told his wife and his friends how greatly Mordecai's presence annoyed him. He boasted loudly to them of the honors both the King and the Queen were bestowing upon him, but he complained about the contempt this humble Jew, Mordecai, had shown. Haman's wife and his friends urged him to prepare a high gallows and ask permission of the king to hand Mordecai. Then he might enjoy fully the honors that were being shown by every one else except by this much-despised Jew. Haman thought their advice sounded good, and he set to work at once to have a gallows built. That night Ahasuerus, the King, could not sleep. As he tossed restlessly about on his soft pillows he commanded his servants to bring the book of records and read to him about the things that had happened since he had been the rule of Persia. And among the other things he heard them read from the book was Mordecai's report of the evil plans of two servants who intended to kill the King. "Has any honor been shown to Mordecai for that kindness done to me? And the servants answered, "Nothing has been done for him,"
Haman rose early the next morning and went to the palace, intending to ask the King's permission to hang Mordecai on the gallows he had made. But just as he entered the court of the palace, Ahasuerus sent for him. And he came in proudly, wondering what service he could perform to please his ruler. "What shall be done to the man whom the King delights to honor?" asked Ahasuerus of Haman. And Haman thought quickly, "Whom would the King delight to honor more than me?" so, believing that the honor would be shown to him, he answered, "Let the man whom the King delights to honor be dressed in the King's royal garments, and let him ride upon the King's horse, with the King's crown upon his head. Let one of the most noble princes place the royal garment upon this man, and the crown upon his head, and let the prince bring him on horseback through the streets of the city and cry out before him that all may hear, 'This is done to the man whom the King delights to honor.'" The King was pleased with Haman's answer, and he said, "You are my noble prince, so I command you to take my royal garment and my crown, and hasten to dress Mordecai in them. Then put him on my horse and lead him through the city, proclaiming before him the words that you have spoken. See that you do everything as you have advised should be done to the man whom I delight to honor." Now Haman was frightened, but he dared not disobey the King's command. He took the garments, dressed Mordecai, the Jew, in them, and led him on horseback through the city streets, crying out, "This is done to the man whom the King delights to honor!" Then he returned with Mordecai to the palace, and brought back the royal garments to the King. Afterwards he ran home, covering his head in shame and sorrow, for he dared not speak to the King about the matter that had brought him to the palace at the early morning hour. And his wife and friends heard this story, and feared that greater troubles might soon befall him if the King was showing favor to the despised Jew. Haman had forgotten about his invitation to dine again with the King and Queen. So the King sent a messenger to bring him to the palace. And then, as they sat about the table the King asked Esther the third time what her wish was, that she desired of him. And the third time he promised to grant that wish even though it should be the half of his kingdom. Now Esther was ready to tell her story. She may have heard that very morning how highly the King honored Mordecai; for she spoke with courage and said, "If I have found favor in your sight, O King, and if it please you, I ask that my life and the lives of my people may be spared, for we have been sold--not to become slaves, but to be killed." Ahasuerus was surprised to hear these words. He asked, "Who is he, and where is he, who would dare to do such a thing?" and Esther answered, "That enemy is this wicked Haman." Now Haman was frightened, and he did not know what to do. He had never guessed that the beautiful Queen was a Jewess. He did not know, even yet, that she had been brought up by Mordecai, the man whom he so much despised. Speechless he sat before them, and when he saw the King rise up in anger and leave the room, he sprang from his seat and feel before Esther, begging for mercy from her. The King walked about in the garden, wondering what he should do to punish Haman. Then he returned and found Haman pleading for his life. But his pleading could not profit him nothing, for the King's servants came in and covered his face, ready for death. Then they led him out, and one of the servants showed the King the high gallows that Haman had prepared to hang Mordecai. "Hang Haman on the gallows!" commanded the King, and Haman was hung on the gallows he had commanded others to build for an innocent man. After Haman's death, the King raised Mordecai to a place of great honor in the kingdom, and he sent letters to every part of the land where Haman's letters had gone, telling the Jews to fight for their own lives on that day appointed when Haman had wished to put them to death. Because their enemies feared them, they did not try to kill the Jews on that day, for even the rulers of those lands helped the Jews. And the Jews celebrated the day of their great victory with a great feast, called the Feast of Purim. Even today the Jews keep this feast, and they always tell the story of Esther, the beautiful queen, who saved the lives of her people.